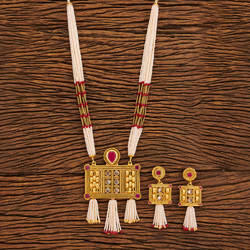 We are offering Antique Pendant Set. Set which Is meant to set a trademark with it’s Eye Catching Pearl White, Ruby Red, Purple Mantle Beads highlighting gold plated alloy giving a traditional touch within Lady to match it’s Attire. We rule the market by providing an exclusive collection of Antique Pendant Sets. We are offering to our valued customers a wide range of Antique Diamond Pendant Sets. 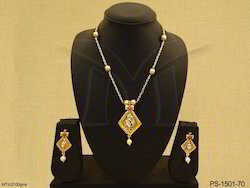 These Antique Diamond pendant sets exhibit excellence in design and craftsmanship. These Antique Diamond pendant sets are more durable and compatible in nature and also huge demand in market. 3.Available in Different Colors and Designs. Today's women is looking to express their individuality with unusual designs and Sweta Art Jewellers Is the perfect choice.Base Metal : Copper.